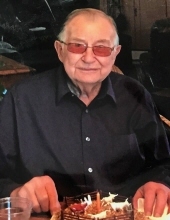 Age 92 of Corunna passed away Saturday, February 2, 2019 at The Meadows. A Memorial Service will be held 11am Wednesday, February 6, 2019 at Juddville United Methodist Church with Pastor Peter Walker Crawford officiating. The family will receive friends. at Nelson-House Funeral Homes, Owosso Chapel on Tuesday from 4pm to 8pm. Bruce was born October 17, 1926 in Hazleton Township, the son of Howard and Bertha (Shuman) Conklin. He graduated from Flushing High School, class of 1943 and was member of Juddville United Methodist Church. Bruce was a 4-H club leader, Farm Bureau member and spent 8 years on the Corunna School Board. He married Nancy Marguerite Lay in Flushing on August 30, 1947; she predeceased him on March 13, 2014. Bruce was a second generation dairy farmer and worked at the Flint Auto Auction later in life. He is survived by his sons David (Donna) Conklin, Daniel (Janis) Conklin and Kurt (Barbara) Conklin; grandchildren Ryan (Amy) Conklin, Rebecca (Scott) TerMeer, Clay (Amy) Conklin, Meghan (Matt) Pennell, Pete Conklin, Samantha (Jeff) Raudebaugh, Luke (Sarah) Conklin and Bryce (Stephanie) Conklin; 13 great-grandchildren; other loving family and friends. Bruce was predeceased by his sisters Joyce McConkey, Donna Brown, June Jansen. The family wishes to express a special thank you to all the caregivers at the Meadows who provided comfort and care for Bruce. Memorial contributions will be made according to Bruce's wishes. To send flowers or a remembrance gift to the family of Bruce Howard Conklin, please visit our Tribute Store. "Email Address" would like to share the life celebration of Bruce Howard Conklin. Click on the "link" to go to share a favorite memory or leave a condolence message for the family.